Consistently healthy sales performance has enabled Cadillac to surpass 100,000 vehicles sold in China during the first 11 months of 2016. 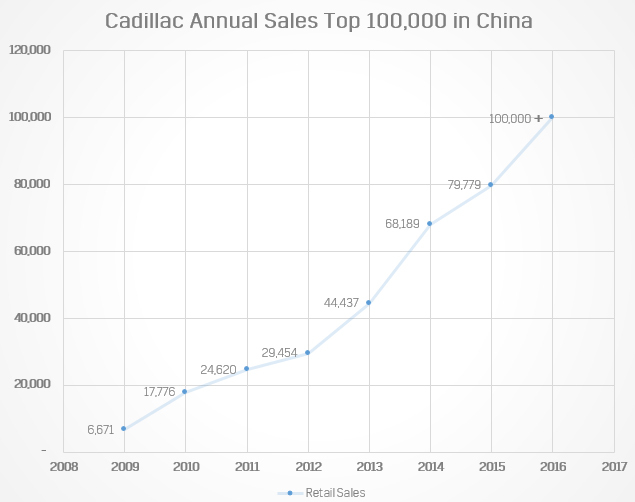 Not only do the results represent a 54 percent increase over the same time frame in 2015, but they also set a notable milestone in which Cadillac has sold over 100,000 vehicles in China during a single calendar year — a first for the brand in the Chinese market. What’s more, December sales figures are likely to raise Cadillac’s final 2016 sales figure in China to well over 100,000 units. Cadillac states that it has been recognized by Chinese luxury car buyers for its distinctive image as the “New American Luxury”. The brand is continuing to expand its product portfolio and dealer network, as well as improving customer service in China — the second-largest car in the world. In 2016, Cadillac has introduced two new models: the CT6 full-size prestige-luxury sedan and XT5 luxury crossover. Both vehicles are produced at Cadillac’s new, state-of-the-art manufacturing facility in Shanghai. In the medium-term future, the brand will introduce three new crossovers — one above the new XT5 and two below it. That’s gotta hurt. . . And should a trade war erupt between the US and China, that annual sales curve might just be the opposite in the future. If I were an exec at GM, I would be more than a little nervous until the new administration makes its China trade policy clear. And then there’s the issue of those pesky islands they built, which could boil over if either side gets pushed . . . that would definitely have serious trade repercussions. That should have Ford going bananas as well.. and VW for that matter.. or any western maker. If China pulls that BS.. it will hurt them way more than it will us if Trump decides to make good on his threats in leveling the field.